January 30, 2019 -- Palmero Healthcare, a subsidiary of Hu-Friedy, has introduced new starter packs of its disposable safety eyewear. 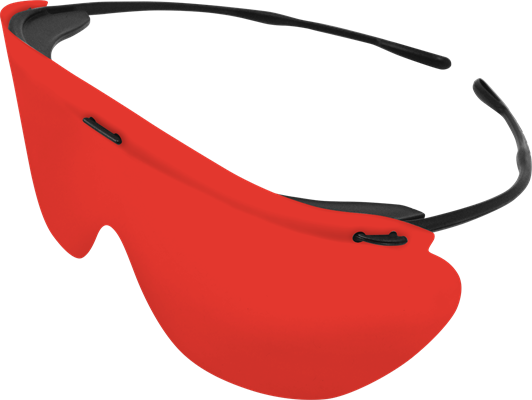 The Dynamic Disposables safety eyewear with an orange bonding lens. Image courtesy of Palmero Healthcare. The Dynamic Disposables safety eyewear office packs contain 10 reusable frames, a cord, and 20 disposable lenses that are available in two colors of bonding lenses. The orange bonding lens provides protection from harmful blue light rays. The gray bonding lens offer patients protection from harmful ultraviolet A and B (UVA/UVB) lights. The lightweight shields prevent splatter exposure and meet Occupational Safety and Health Administration bloodborne pathogen personal protective equipment guidelines.